ArrayList and Vector both implements List interface and maintains insertion order. 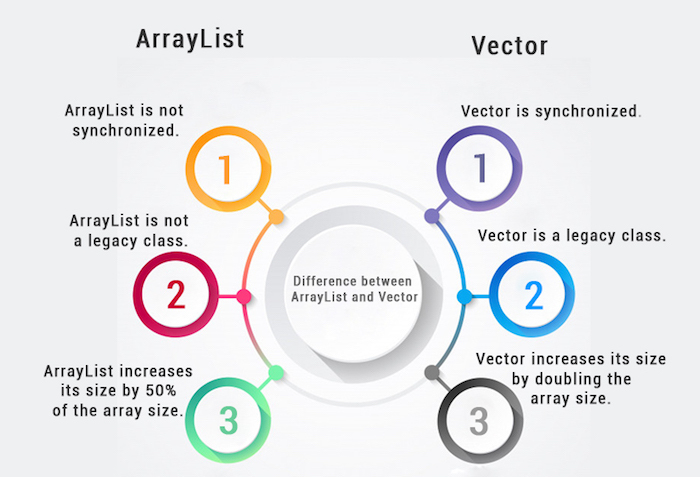 However, there are many differences between ArrayList and Vector classes that are given below. 1) ArrayList is not synchronized. Vector is synchronized. 2) ArrayList increments 50% of current array size if the number of elements exceeds from its capacity. Vector increments 100% means doubles the array size if the total number of elements exceeds than its capacity. 3) ArrayList is not a legacy class. It is introduced in JDK 1.2. Vector is a legacy class. 4) ArrayList is fast because it is non-synchronized. Vector is slow because it is synchronized, i.e., in a multithreading environment, it holds the other threads in runnable or non-runnable state until current thread releases the lock of the object. 5) ArrayList uses the Iterator interface to traverse the elements. A Vector can use the Iterator interface or Enumeration interface to traverse the elements. Let's see a simple example where we are using ArrayList to store and traverse the elements. Let's see a simple example of a Java Vector class that uses the Enumeration interface.